The last two weeks have been very busy with our 2nd Taiwan University students’ Educational tour to Dharamsala, jointly organized by Taiwan Friends of Tibet and Students for a Free Tibet-India. The program was initiated last year to introduce the Tibetan movement, culture, religion and community in exile, showcase the real situation inside Tibet to the young educated Taiwanese and to create a stronger network in Taiwan. This year the students visited the Central Tibetan Administration, various NGO’s, Monasteries, Schools and also had an opportunity to meet Dr. Lobsang Sangay, Kalon Tripa of Tibet and Mr Penpa Tsering, Speaker of Tibetan parliament in exile and many other prominent leaders, activists, writers and ex political prisoners etc. During the first day of our welcome gathering, my friend Tenzin Tsundue suggested the screening of Taiwanese movie ‘Warriors of the Rainbow: Seeediq Bale’ to the Tibetan public in Dharamsala so that we can make it a two way learning process. I thought that this would be a great opportunity to know more about the history of Taiwan and also for the students to have a first hand experience of our events in Dharamsala. 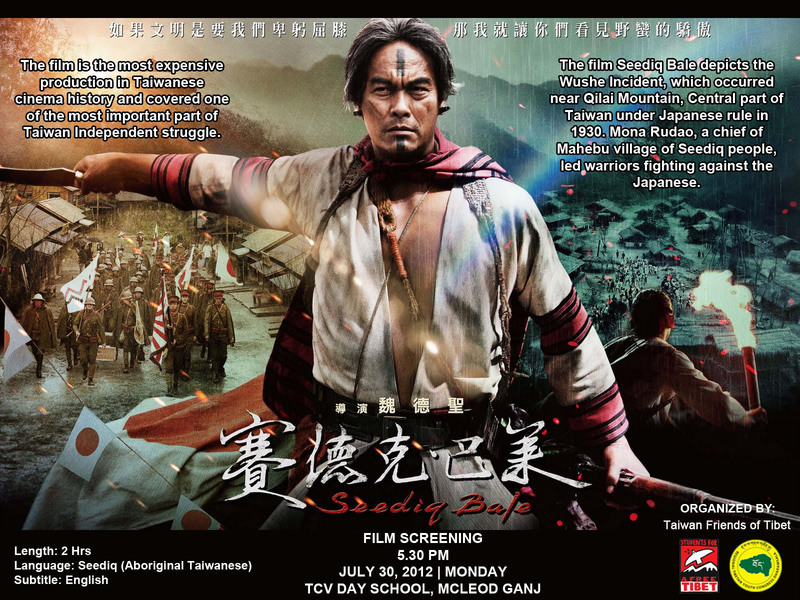 The film is based on a true story about a native Taiwanese tribe called ‘Seediq’ and depicts the Wushe incident, which occurred in Central part of Taiwan in the year 1930 during Japanese rule. The Term ‘Seediq Bale’ means Real Men and in the film Mona Rudao, the Chief of the Mahebu Village of Seediq people led the uprising against the Japanese rule. To become a ‘Seediq Bale’, a person needs to have the courage to follow their ancestral path and protect the land and hunting ground from their enemies and die in the battleground with pride. Initially some of our Taiwanese friends were a little reluctant about screening it to the Tibetan people as it had strong visually violent images and they felt a little uncomfortable as Tibetans being Buddhists engage in non-violent movement. I explained to them about the ‘ChuShi GangDuk’ (Four Rivers and Six Ranges) Tibetan volunteer guerrilla force, founded on 16th June 1958 by Andruk Gompo Tashi to fight against Chinese Invasion in Tibet. Most of them didn’t know about it and I was not surprised as even many of our young Tibetans are not aware of this part of our History. In the movie when Mona Rudao, the chief of tribe led the uprising with 300 young Seediqs men against thousands of Japanese who were far ahead in terms of arms and ammunition, technology and resources, other tribe leaders questioned him about what they can achieve by waging a losing battle which will cause only death. His response was ‘Pride’ to live and die as Seediq Bale and to be remembered by generations and to follow the path of their ancestors to protect their land and dignity. Throughout the movie I couldn’t stop thinking about ChuShi GangDuk Tibetan arm resistance. I have seen some documentaries such as ‘Raid into Tibet’and The shadow Circus: CIA in Tibet and interviews of those brave men and women who also fought a losing battle against the Chinese invasion. I remember one of the interviews by a resistant army saying they were airdropped in the middle of thousands of Chinese forces and it looked like throwing pieces of meat in front of hundreds of hungry dogs. But they didn’t stop; they jumped wearing the picture of their Lama on their neck along with Cyanide to avoid getting arrested alive. I think they were no different than the Seediq Bale who fought and died for their pride and love for their land and didn’t accept to bow down under foreign invasion. But the most important thing to be remembered by the generations to come of those who will carry forward the pride that their forefathers had kept till their last breath. The Taiwanese students told me that today the ‘Seediq Bale-Wushe incident’ is taught in schools to be remembered as one of the most important part of Taiwan History and the film that was released to public this year has already drawn a lot of attention and awareness and generated a sense of pride in many of the Taiwanese people, especially in the heart of the native people. I read in the movie review that many of the tribe people ‘Seediq’ who are now marginalised to only 2 % in Taiwan came to the cities in their traditional clothes on the day when the movie was released. But the story is very different in our Tibetan community. Very less number of Tibetan youngsters knows about our own Tibetan heroes who fought and died for Tibet. I only read few pages about ‘ChuShi GangDuk’ and how it helped in bringing His Holiness safely to Exile in India in ‘My Land and My People’ the autobiography of His Holiness the 14th Dalai Lama which was taught in 11th standard during my school. But being raised up in a Khampa family my father used to tell me stories of those brave men and women and how my family was given shelter by those warriors for few days on their way to exile. They were in hundreds and rode fearlessly and called themselves the protector of Buddha Dharma and protector of the Dalai Lama. The arms resistance was even continued in Exile by making Mustang in Nepal as their base with around two thousands young men. 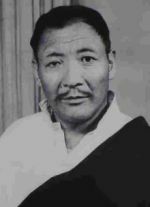 Tibetan Guerrillas conducted much successful operations in Tibet and it lasted till 1974 when CIA finally cut off its supplies and His Holiness asked the resistance to lay down their guns due to mounting pressure from Nepal Govt. I heard many suicide by cutting their throat or jumping to river who could not lay down their weapons. Many also later joined Special Frontier Force (SFF) also know as Establishment 22 created by govt. of India after Sino-India war in which thousands of Tibetans also joined with the hope that one day they will have the opportunity to fight with China but the day never came. 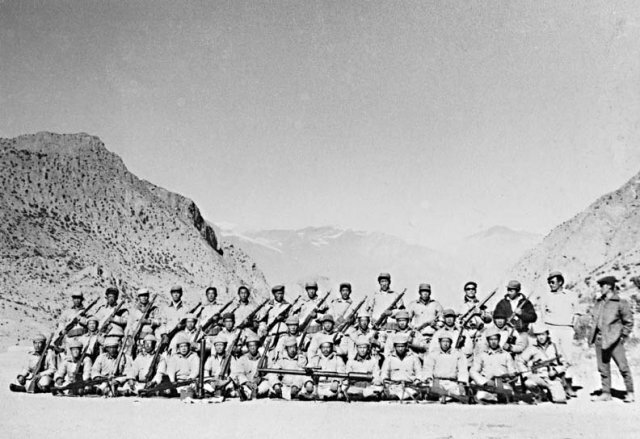 Instead Tibetan armies fought in many top-secret missions in Bangladesh and the Kargil war for India. I believe it is a gross injustice for those brave souls who laid down their life for the nation if our new generations knew little or nothing of them. This part of our history needs to be taught in all the schools and every Tibetan institution to make our younger generation know about all those unsung Heroes of Tibet. Its been 53 years in exile and we are following a non-violent path to gain our freedom back. For any movement to succeed we need Courage, Determination, Pride and hope in the heart of it’s people. The Tibetan arm Resistance has been and is a big inspiration. That’s why I say that Andruk Gompo Tashi and all those Tibetan resistance fighters as Seediq Bale, the ‘Real Men’ of Tibet. It is such an inspiring tale. I wish Tibet gets its much deserved freedom very soon. And thanks to all the Tibetans for fighting on the Indian side.